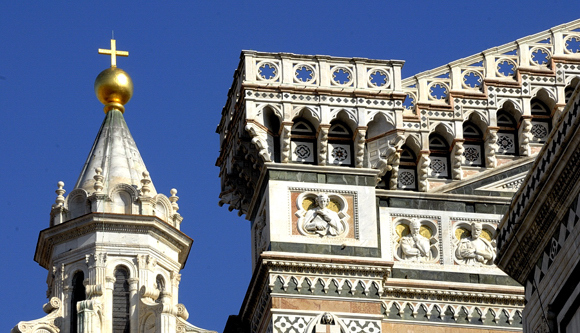 Today, enjoy a visit of Siena ( guided visit) & San Gimignano ( free time). After breakfast, meet your driver and your tour leader and drive to Florence. The drive itself is a magnificent path along the roads of Tuscany, where it is possible to enjoy the view of hills covered by vineyards, olives tree, small villages and original bell towers. The first stop is Siena, probably Italy’s loveliest medieval city, for a walking tour with a local guide. Siena’s heart is Il Campo or Campo’s square, where the famous horse race Il Palio takes place two times each summer. The town offer magnificent masterpieces and incredible views. Enjoy a wine tasting with cheese and salami. In the morning, enjoy a walking tour of the city with guide with Accade- mia. Lorenzo de Medici transformed Florence into the cradle of the Renais- sance by attracting the best artists, architects and writers of the time such as Leonardo da Vinci, Michelangelo and Botticelli to whom he com- missioned various works. Visit Piazza della Signoria, Palazzo Vecchio, the Dome with Giotto’s bell tower, Ponte Vecchio, Santa Croce. Spend the afternoon at leisure exploring Florence on your own, visiting the Uffizi or taking the opportunity to visit Chianti or Lucca. Overnight in Florence. The day is free at leisure. There are many optional tours available: Pisa with its leaning tower, Montepucliano and Montalcino, Cortona, Assisi, Perigia and many others. Late afternoon, transfer to Chianti area for a unique experience. Enjoy the view of the beautiful hills covered by vineyards and have a fantastic dinner in a farm house, accompanied with Chianti wine. Return late evening at hotel. After breakfast, meet your expert driver guide and continue to Pisa. Here, meet your local guide and visit the city. Pisa is most famous for its Leaning Tower, but the old Maritime Republic offers incredible sights like Miracles’ square, the beautiful Battistero and many other masterpieces. At the end of the excursion, proceed to Portovenere. Dinner will be served in a typical restaurant. Overnight in Portovenere. After breakfast, meet your guide and embarkation to visit of Cinqueterre from the sea. Stop in Monterosso and Vernazza to enjoy these beautiful villages. Free time in Monterosso, then meet your driver and drive to Portofino to enjoy the colors of late afternoon. Return to Portovenere. In the evening enjoy a tasty dinner in Por- tovenere. After breakfast transfer on your own to airport or railways station. From €1900, per person, based on double occupancy. Single room package from€2556 .